California quadrupled the amount of renewable energy it installed in 2008 over the previous year, according to a report released Wednesday by the state’s Public Utilities Commission. The 500 megawatts of green electricity brought online last year represents 60% of all renewable energy generation built since 2002, when California mandated that the state’s investor-owned utilities obtain 20% of their power from renewable sources by 2010. In November, Governor Arnold Schwarzenegger signed an executive order raising the Renewable Portfolio Standard, or RPS, to 33% by 2020. 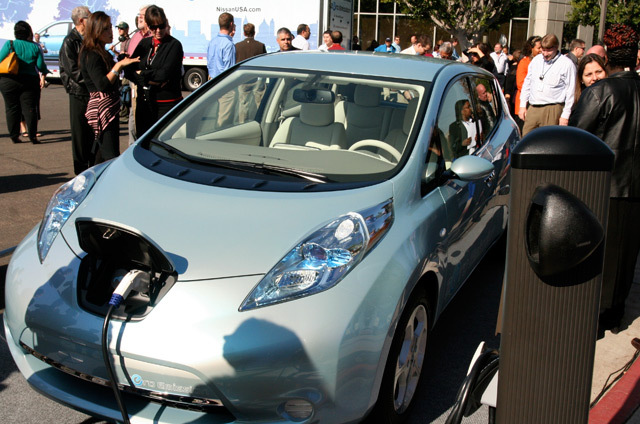 “Clearly, 2008 was a turning point for the RPS program and contracted projects are beginning to deliver in large numbers,” the California Public Utilities Commission report stated. The CPUC in 2008 approved projects that would generate 2,812 megawatts of renewable energy for California’s Big Three utilities – PG&E (PCG), Southern California Edison (EIX) and San Diego Gas & Electric (SRE). Impressive numbers but the utilities have acknowledged they are unlikely to meet their renewable energy targets by the 2010 deadline because it takes years to get solar and wind projects online and some will inevitably fail. For instance, the financial crisis has raised questions about just how many of the Big Solar power plants the utilities are relying on will actually get built, though the $787 billion stimulus packaged signed into law Tuesday by President Barack Obama has brightened the solar industry’s prospects. California increasingly is depending on solar energy to meet its commitments to reduce greenhouse gas emissions under the state’s landmark 2006 global warming law. According to regulators, utilities received 30% more bids for solar power projects in 2008 than in the previous year while wind farm proposals dropped by half and “very few” geothermal tenders were filed. The fact that utilities received 24,000 megawatts’ worth of renewable energy bids last year (more than enough, if built, to meet the 33% renewable energy target) speaks to the frothy state of the market. But before solar power plants and other green energy projects can go online they face years-long and often contentious environmental reviews, while a lack of transmission lines to bring all this electricity from the desert to coastal cities remains the green elephant in the room. Meanwhile, regulators are reviewing a policy change that would seem to undercut the state’s goal of encouraging utilities to generate more renewable energy. On March 12 Feb. 20,the California Public Utilities Commission will consider whether to allow utilities to buy so-called tradable renewable energy credits, or TRECs, from other entities to meet their green electricity mandates. Such credits are associated with the electricity generated by wind farms, solar power plants and other projects and can be bought and sold. In other words, if a utility finds itself falling short of its renewable energy goals – or just doesn’t want to spend the money procuring green power – it could buy TRECs on the open market. Green Wombat is awaiting a reply from the utilities commission on whether California utilities could purchase TRECs generated by out-of-state projects – which, of course, would do nothing to reduce the state’s own greenhouse gas emissions. UPDATE: CPUC spokeswoman Terrie Prosper says that utilities will be able to buy out-of-state TRECs as long as they meet California’s eligibility requirements. With Big Solar thermal power plants bogged down in bureaucracy and facing environmental and financial hurdles, utilities are turning to smaller-scale thin-film solar stations that can be built in a matter of months. In late December, PG&E (PCG), for instance, signed a 20-year contract for electricity generated from a 10-megawatt thin-film solar power plant in Nevada owned by energy giant Sempra (SRE) that was officially dedicated on Thursday. The solar farm was built by First Solar (FSLR) in a scant six months. Meanwhile, the utility’s nearly two gigawatts worth of deals with solar thermal power companies won’t start producing power for another two years at the earliest. (Southern California Edison (EIX) and San Diego Gas & Electric signed agreements with solar dish developer Stirling Energy Systems for 1.75 gigawatts in 2005 and those projects are just now beginning to move through the regulatory approval process.) And the financial crisis has made it more difficult for solar thermal developers to obtain the billions of dollars needed to finance the construction of a massive megawatt power plant. That’s good news for companies like First Solar – the Tempe, Ariz.-based company backed by the Walton family that is often called the Google of solar for its stock price and market prowess – and SunPower (SPWRA), the Silicon Valley solar cell maker that’s moved into the power plant-building business. Nathaniel Bullard, a solar analyst with New Energy Finance, says he expects utilities increasingly to bet on smaller-scale photovoltaic farms to help meet state mandates to obtain a growing percentage of their electricity from renewable sources. Just this week, PG&E CEO Peter Darbee said his utility plans to invest in solar power plant projects rather than just buy the power they produce. That’s because in California photovoltaic power plants do not need approval from the California Energy Commission. And smaller-scale plants take up far less land and can be built close to existing transmission lines. 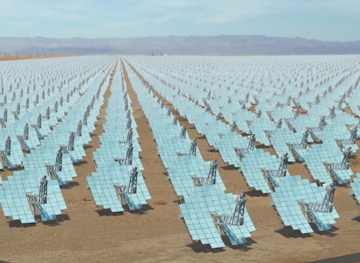 Most large solar thermal power plants typically are planned for the Mojave Desert and require the construction of expensive power lines to connect them to the grid. The modular nature of PV solar farms means they can begin generating electricity as each segment is completed while a solar thermal plant only goes online once the entire project is finished. Nearly three years ago, two Southern California utilities caused a stir when they announced deals to buy up to 1.75 gigawatts of electricity from massive solar farms to be built by Stirling Energy Systems of Phoenix. The company had developed a Stirling solar dish – a 38-foot-high, 40-foot-wide mirrored structure that looks like a big shiny satellite receiver. The dish focuses the sun’s rays on a Stirling engine, heating hydrogen gas to drive pistons that generate electricity. Plans called for as many as 70,000 solar dishes to carpet the desert. For Southern California Edison (EIX) and San Diego Gas & Electric (SRE) – both facing a state mandate to obtain 20 percent of their electricity from renewable sources by 2010 – it was a big gamble. As the years ticked by and Stirling tinkered with its technology, competitors like Ausra, BrightSource Energy and Solel came out of stealth mode and stole the limelight, signing deals with PG&E (PCG) and filing applications with California regulators to build solar power plants. 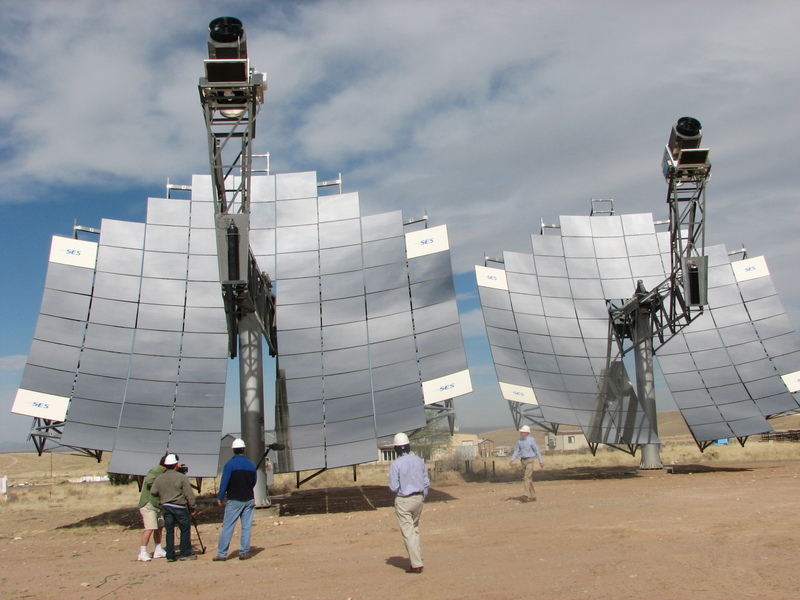 By the time I visited Stirling’s test site in New Mexico in March 2007 for a Business 2.0 feature story, industry insiders were telling me – privately, of course – that Stirling would never make it; Stirling dishes were just too complex and too expensive to compete against more traditional solar technologies. The first phase of the SES Solar Two project will consist of 12,000 SunCatcher dishes generating 300 megawatts for San Diego Gas & Electric. While the Stirling solar dish is more complex and contains more moving parts than other solar thermal technologies – which use mirrors to heat liquids to generate steam to drive a standard electricity-generating turbine – or photovoltaic panels like those found on rooftops, it also offers some distinct advantages. For one thing, it’s the most efficient solar thermal technology, converting sunlight into electricity at a 31.25% rate. Each 25-kilowatt dish is in fact a self-contained mini-power plant that can start generating electricity – and cash – as soon as it is installed. Stirling will build 1.5-megawatt clusters of 60 dishes that will begin paying for themselves as each pod goes online. A conventional solar thermal power plant, of course, must be completely built out – which can take a year or two depending on size – before generating electricity. The 750-megawatt Stirling project will also use relatively little water – no small matter in the desert – compared to other solar thermal plants. According to Stirling, SES Solar Two will consume 33 acre-feet of water – to wash the dishs’ mirrors – which is equivalent to the annual water use of 33 Southern California households. In contrast, a solar power plant to be built by BrightSource Energy that is nearly half the size is projected to use 100 acre-feet of water annually while a 177-megawatt Ausra plant would use 22 acre-feet, according to the companies’ license applications. Still, there’s some big hurdles for Stirling to overcome. While it did score a whopping $100 million in funding in April from Irish renewable energy company NTR, the company will need billions in project financing to build Solar Two. And the project’s second 450-megawatt phase is dependent on the utility completing a controversial new transmission line through the desert called the Sunrise Powerlink. Depending on how fast the project is approved, construction is expected to begin in 2009 and last more than three years. The other big unknown is what environmental opposition may develop. Within 10 miles of the SES Solar Two site are proposals to build solar power plants on an additional 51,457 acres of BLM land. Then there are the wildlife issues. Several California-listed “species of special concern” have been found on the Stirling site, including the burrowing owl, flat-tailed horned lizard and the California horned lark.